Happy New Year and welcome to the first TGIFF of 2016! We’ve announced some changes to TGIFF and the signups are open for 2016 hosting, so head on over to the blog and check it out. I have a heap of little finishes. Firstly, my second Mini Quick-Curve-Ruler Xmas tree table runner got finished just after Christmas. This one was low volume and gold tinted with one lone stand-out tree. There’s a lot of FMQ – I hadn’t done much for a while so needed to get my eye back in. The white turned me snowblind rather – no mean feat in an Australian summer! I probably should have drawn the stars but the whole piece has a rather improv feel to it so I don’t mind. I’m now not sure whether I like my original high contrast or the low volume one better! New job, new year and new name (reverting back to my maiden name) also seemed to indicate that a new laptop was in order. I’m travelling most of January and will be working on the go, so a .5kg lighter Macbook won the day. It came without protection (and we can’t have it contracting who knows what) so I pulled out some long cherished Terrain laminate (thank you Kate Spain, you are a design goddess), a half yard of hot pink Madrona Road for the lining, and some soft and stable and I have the the snazziest laptop pouch this side of the equator. 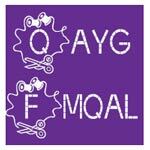 Do you have any quilty finishes? If so, please join me by linking up and including a link back to TGIFF. If not, please enjoy visiting the other lovely linkers here! One door closes and another opens! Happy New Year Laura. Pretty pouch! Happy New Year! Congratulations on using your quick curve ruler. I have several books of patterns for it but haven’t had the time yet to devote to learning something new. Maybe later this year. I just keep reading the instructions. I also like that you didn’t use the traditional Christmas colors, so you can technically keep it out all year long. It just becomes a forest instead of Christmas trees! Love your tablerunners, both. Your Mac is lucky!! Ooh, great finishes, Laura! Hope you have a great trip and Happy New Year! So happy for you! I love the black and white table runner Laura, and your laptop pouch is definitely the business 🙂 Have a great trip. I love the trees and I need to make a pouch for my new tablet. Thank you for the inspiration. I love both of your tree runners, but the low volume is definitely my favourite! The laptop case is beautiful too…no chance of it blending in with bland and boring luggage 🙂 Have a great trip!